Our preferred option to the eastern dogwood, this more disease resistant species also has spectacular white blooms. They appear in June, usually have blotches of pink to burgundy, especially as the long-lasting blossoms age. Later in the summer, delightful red, strawberry-like fruits decorate the tree. 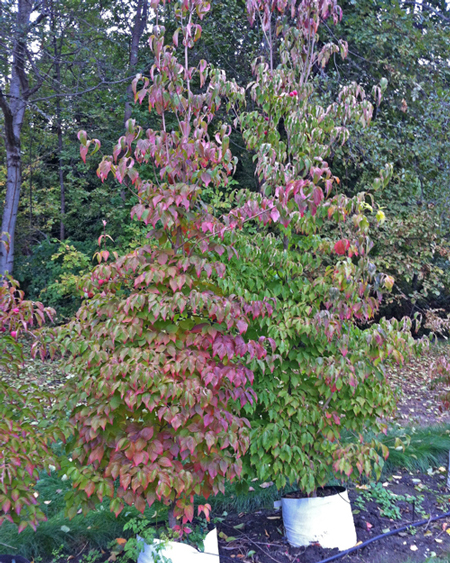 Broadly conical, with a delicate horizontal structure, this one delights again in the fall with its brilliant display of gold, pink, scarlet and burgundy fall color. Train it as a single-stem tree to 15-20 feet, or enjoy its multi-stemmed form. It needs to have its trunk protected from sun scald, so give it some light shade, humus-rich soil, and moderate water.